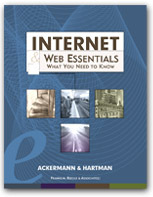 This material has been prepared to accompany the book "Internet and Web Essentials" (ISBN 1887902460) by Ernest Ackermann and Karen Hartman, and published by Franklin, Beedle and Associates, Incorporated, Wilsonville OR, ©2000. No part of this may be reproduced, stored in a retrieval system, or transcribed without permission of the publisher. FTP stands for File Transfer Protocol. With FTP, you can share or copy files from one Internet site to another. Anonymous FTP is the term used for when you copy a file from one computer to another without giving a login name or a password. Collections of files available by anonymous FTP are called anonymous FTP archives. Literally trillions of bytes of information, programs, and resources are available by anonymous FTP. Archie, one of the first Internet search programs, is a tool specifically designed for searching anonymous FTP archives. When you supply a keyword, the names of the files, directories, and sites in the database are searched. Several other search services and software libraries search a database that holds descriptions and reviews of software available through anonymous FTP. Some of the software archives also have entries arranged by the type of program (for example, antivirus programs) or by the operating system (for example, Windows 95 or Macintosh). Transferring a file from another computer to the computer youre using is called downloading. Thats what you do when you retrieve a program from an FTP archive or software library. Many of the programs depend on a number of auxiliary files to be run and used effectively, such "as online help files. These files are put together into a package, and the "contents are compressed to allow for easier and faster storage and transfer. After you retrieve one of these packages of software, you need to process it to extract the components. If the package name ends with .exe, then its a self-extracting archive. Click on the name of the package, and it will unpack itself. If the name ends with .zip, youll need to use a program, such as PKZIP or WinZip. Once the files are extracted, you will run a program (application) to install the program. To be safe, youll also want to scan the software for computer viruses before you install it. Look for a file with a name such as Readme, and read it before you install the program. It may help you decide whether the program is appropriate for you and your computer system. Sometimes the Readme file is available after installing the program. Finally, look for a programoften named Setup or Installthat youll run to install the program. An FTP client program is one that you run on your computer to exchange files with another computer that acts as the host, or server. This program is not usually part of a Web browser. To access another computer through FTP, you need to give the client program the Internet domain name for the host computer. Thats the part of the URL that immediately follows ftp://. For example, in the URL ftp://ftp. "jpl.nasa.gov/pub/images/browse/marglobe.gif, the domain name is ftp.jpl.nasa.gov. Once connected, you can upload files from your computer to the host or download files from the host to your computer. You can do either one by using a graphical interface provided by the client or by using the commands put and get. There are many ways to retrieve information you have found on the Internet. You can save images and insert them into word-processing documents on your computer or into PowerPoint presentations. You can also print or save portions of Web pages and download data into spreadsheets. This chapter provided step-by-step instructions for accomplishing many of these procedures. You need to protect your computer system from viruses. Try one of these shreware products and then buy some antivirus protection. WS_FTP is a popular shareware FTP client. Here are some guides to help you learn how to use it. MP3 is a file format that's allows for excellent compression and storage of CD quality music. No wonder it's the prefferred way to exchange music files. A list of some of the more popular shareware archives for Windows, Mac, and Linux operating systems. Some sites to check when you'er looking for software archives, collections of shareware.